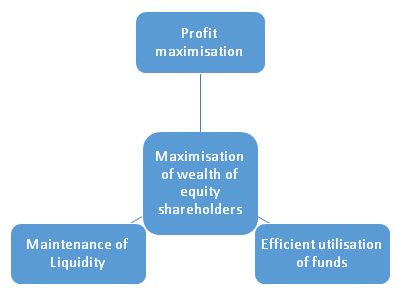 The main and foremost objective of financial management is to maximize the wealth of equity shareholders. This objective automatically fulfills many other objectives. As equity shareholders get share from residual income only i.e. they are given dividend only after the claims of suppliers, employees, lenders, creditors and any other legitimate claimant. Therefore if the shareholders are gaining, it automatically implies that all other claimants are also gaining. The objective of increase in value of equity share does not mean that finance manager should involve in manipulative activities to bring rise in price. The rise in price must come with the growth of firm, with increase in profit of firm and with satisfaction of all the parties associated with the company. The finance manager in a company makes decision for the owners i.e. the shareholders of the firm. He must take such decisions which will ultimately prove gainful from the point of view of shareholders and they gain only when the price of their share increases in the market. So, financial decision which results in increase in value of share is considered very efficient decision. On the other hand, the decision which brings fall in the value of equity share is considered to be a poor decision. This decision relates to careful selection of assets in which funds will be invested by the firms. A firm has many options to invest their funds but firm has to select the most appropriate investment which will bring maximum benefit for the firm and deciding or selecting most appropriate proposal in “Investment decision”. The firm invests its funds in acquiring fixed assets as well as current assets. When decision regarding fixed assets is taken it is also called capital budgeting decision. They are long term decisions and therefore are irreversible, means once taken cannot be changed. 1. Involvement of huge amount of funds. 2. Affect the future earning capacity of the company. 3. The finance manager must compare all the available alternatives very carefully and then only decide where to invest the most scarce resources of the firm i.e. finance. 1. Owner’s Fund – Share capital & retained earnings. 2. Borrowed Fund – Debentures, loans, bonds etc. There are many factors that affect the financing decisions such as cost, risk, control considerations, floatation cost, fixed operating cost and state of the capital market. While taking this decision the finance manager compares the advantages and disadvantages of different sources of finance. The borrowed funds have to be paid back and involve some degree of risk whereas in owner’s fund there is no fix commitment of repayment and there is no risk involved. But finance manager prefers a mix of both types. Under this, finance manager fixes a ratio of owner’s fund and borrowed fund in the capital structure of the company. This decision is concerned with distribution of surplus funds. The profit of the firm is distributed among various parties such as creditors, employees, debenture holders, shareholders etc. Payment of interest to creditors, debenture holders etc. is a fixed liability of the company, so what company has to decide is what to do with residual or left over profit of the company. The surplus profit is either distributed to equity shareholders in the form of dividend or kept aside in the form of retained earnings. To take this decision finance manager keeps in mind the growth plans and investment opportunities. If more investment opportunities are available and company has growth plans then more is kept aside as retained earnings and less is given in the form of dividend. But if company wants to satisfy its shareholders and has less growth plans, then more is given in the form of dividend and less is kept aside as retained earnings. This decision is residual decision because it is concerned with distribution of residual or left over income. i. Constant dividend per share: In this case, the company decides a fixed rate of dividend and declares the same rate every year, e.g. 10% dividend on investment. ii. Constant payout ratio: In this case, the company fixes up a fixed percentage of dividend on profit and not on investment, e.g. 10% dividend on profit so it keeps on changing with change in profit rate. iii. Constant dividend per share plus extra dividend: In this scheme, a fixed rate of dividend on investments is given and if profit or earnings increases then some extra dividend in the form of bonus or interim dividend is paid. 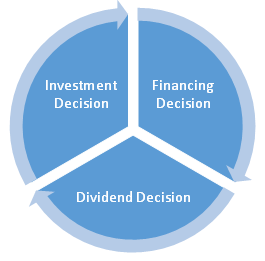 This decision is taken by the finance manager considering all the factors affecting the payment of dividend. After learning the role of financial management in business we can say that the success and failure of an organization depends upon the decisions of financial management. Efficient financial management results in success of business and maximizes the wealth of the shareholders of the company. Truely written the basic objective of financial management is to maximize returns on given level of risk (or minimizing risk on given levels of minimum returns).